Lenses come in an infinite variety of colors and surfaces. All of our lenses include a virtually invisible filter to absorb ultra-violet light. Solid and gradient tints and polarized lenses are great for sunglasses. Some people like a slight cosmetic tint to enhance their appearance or the look provided by their new eyeglasses. Transitions® lenses lighten and darken depending on the surrounding conditions. Reflection free lenses are the single most important innovation for improving your vision available today. Fashion tints, sunlenses or industrial protection Parrelli Optical® can design lenses for any application. All eyes need protection from the burning rays of the sun. 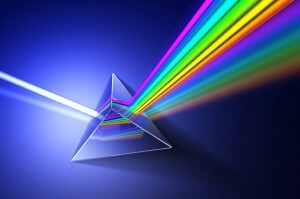 In the visual spectrum ultra violet light is broken into three categories. The shortest wavelengths, UVC are absorbed in the atmosphere and never make it to the surface of the earth. The middle range (290-315nm), higher energy UV B light burns your skin and are absorbed by your cornea, the clear window on the front of your eye. The longest region (315-380nm) are called UVA rays pass to the interior of your eye. This exposure has been linked to the formation of cataracts as this light is absorbed by the crystalline lens. Once the cataract is removed the very sensitive retina is exposed to these damaging rays. Most modern lens materials naturally absorb these burning rays of the sun. A specialize filter can also be added to basic lens designs to offer this protection. Trust the knowledgeable professionals at Parrelli Optical® to design the perfect lens tint for you.